A 23-year-old man has been charged in connection with a number of stabbings at a concert in Dublin's Phoenix Park on Saturday. 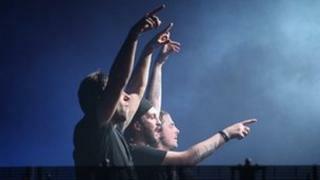 Nine people were injured during the event which was headlined by dance act Swedish House Mafia. Gardaí believe one man stabbed as many as four people, and that the other victims sustained injuries during rows with knives and broken bottles. Three of those stabbed were seriously injured, one critically. A man who died from a suspected drugs overdose at the concert has been identified. He was in his early 20s and from Clonsilla in Dublin. More than 45,000 people were at the concert, which also featured Snoop Dogg, Tinie Tempah and Calvin Harris. A spokesman for concert promoters MCD said CCTV footage had been given to the police. "Ticket holders entering the site were subject to a search permissible by law," said managing director Denis Desmond. "Every precaution, as far as possible, was taken to ensure the safety and security of the audience at all times. "Despite our best efforts - with security and gardaí personnel levels well in excess of the required numbers for a licensed event of this size - there is only so much one can do to combat anti-social behaviour." Thirty people were also arrested and bailed after being charged with assault, drugs and public order offences.